Ericsson was founded by Lars Magnus Ericsson in 1876, and it has headquarters in Sweden. The primary business of the company lies in providing IT and communications technologies to telecom operators, networking equipment, IP networking devices, video systems, mobile broadband, traditional telecommunication services and others. Headquartered in Stockholm, the company today comprises 1.1 lakh employees and operates in about 180 countries. As of 2018, they have a well-established business in wireless communications and currently boast over 42000 granted patents. Ericsson's vision is a Networked Society where connectivity brings people together. The overall Ericsson mission statement is ‘Innovating to Empower People, Business and Society, the long term business strategy and clear internal messages from the senior team that all employees are expected to contribute to the innovation efforts’. 1. A diverse portfolio of cutting-edge technologies: Ericsson has invested in developing products, services, and solutions in various technology domains like Networks, Digital Services, Industries, and Media. The company is also working in new technology like 5G-focused services and its impact on 10 different industry sectors like Automotive, Retail, Media and entertainment, Manufacturing etc. and according to the survey it conducted, about 78% of respondents agreed that their industry would take advantage of 5G to improve or develop new customer offerings. So, this gives Ericsson an advantage ahead of its competitors. 2. Features top-notch positions in several global rankings: Ericsson has been ranked 3rd in “Most Valuable Nordic Brands Top 50” in 2013-16, 10th in “The Most Liked Brands on LinkedIn” in 2012 and 13th in “Top 25 most valuable European Single Brands” in 2009 among many others. The company also received many awards for its various innovative works. It received “2015 Global Mobile Award” for its Connected Vehicle Cloud. Ericsson has also earned recognition for its efforts in being an award-winning employee. It was named “Russia’s Most Attractive Telecom Employer in 2014” and it was also listed in Forbes in 2014 as one of top 10 companies in the USA for “Doing the Most to Make Their Employees Happier”, among many others. 3. Increased focus on R&D: Ericsson places a lot of importance on its R&D, which is why it holds more than 42000 granted patents. It earned SEK 10 billion from its IPR licensing and has spent about SEK 32-36 billion over the past 5 years and the majority of it was spent on Networks in 2016. Services investment and R&D spending are for developing long-term strength of the company, and hence the company is building 3 ICTs, two of which are in Europe and one in North America. Besides, it has the biggest R&D center in Sweden and others in Canada, China, Hungary, and the U.S.
4. Global presence in around 180 countries: Ericsson is globally present in 180 countries which cover Europe and Latin America, the Middle East and Africa, North America, North-East Asia, Sweden and South East Asia, Oceania and India. It has net sales of 7.1, 5.96, 3.67, 3.44, 2.82 and 1.07 billion dollars in Europe and Latin America, North America, SEA and India, Middle East and Africa, North East Asia and Others respectively. This has helped the company to gain access to new suppliers, new markets, and new business partners. Also, the vast diversity of the global workforce, their knowledge and experience become an invaluable asset for the company. 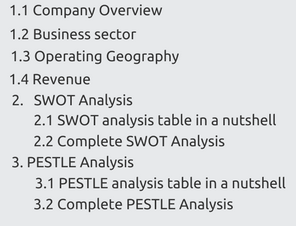 This helped in transferring knowledge before venturing into any new emerging market. 1. Liberalized Telecom industry in Sweden: The telecom industry in Sweden was deregulated by the Sweden parliament in 1980, by which the Government aimed to promote competition in the telecom industry. This resulted in increased competition in the Network equipment market in Sweden, where Ericsson is headquartered. 2. Digital India by PM Narendra Modi: ‘Digital India’ is an ambitious project started by the Indian PM Narendra Modi which seeks to digitally connect whole India, especially the villages and Gram Panchayats so that India can be transformed into a connected country. By 2019, the Government wants to ensure that every village in India enjoys the internet and universal phone connectivity. But this unprecedented demand for data and network infrastructure has posed challenges for Network operators as establishing towers in rural zones is quite unprofitable for them. Ericsson can take advantage of this gap in demand and supply in network infrastructure to setup network towers in villages at a reduced rate under schemes like Digital India and Make in India. 1. Increased demand for high-speed data and data-hungry applications: Globally, the number of internet users has increased by 7% to 4.021 billion and 51% of the population has internet access as of June 2017. As consumers are consuming more data on the move, demand for DSL and fixed line services is falling. Hence there is a significant increase in demand for high-speed data and due to the growth of IoT. To aggregate and analyze a large amount of IoT data sets, data lakes are being built whose market is predicted to grow to $8.81 billion. For this, a strong network infrastructure is crucial. Data protection is also a major concern for consumers. As even telecom operators are falling prey to cyber-attacks, network security is another crucial factor. 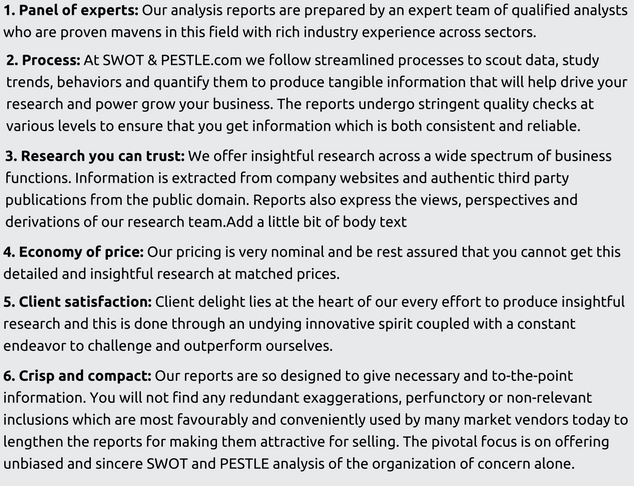 Ericsson SWOT and PESTLE analysis has been conducted by Subhadeep Chakraborty and reviewed by senior analysts from Barakaat Consulting. 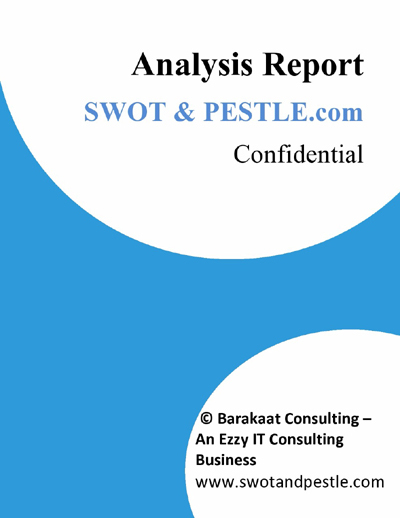 Copyright of Ericsson SWOT and PESTLE Analysis is the property of Barakaat Consulting. Please refer to the Terms and Conditions and Disclaimer for usage guidelines.